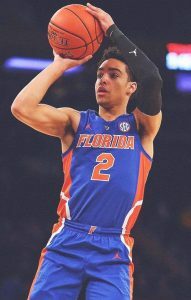 Perhaps Florida’s most consistent player on a team that had some wild ups and downs this past season, Andrew Nembhard was as valuable a player the Gators had on the roster and his return to Gainesville next year gives them one of the best floor generals in college basketball and a player that can control tempo with the best of them. A player with intrigue among NBA scouts I thought there was a chance this past year could have been his only one in orange and blue but in his season-ending press conference Coach Mike White stated Nembhard came up to him saying he was ready to assume a leadership role for the team next year which would make you think he’s coming back for another go. While his passing was elite and his leadership was never questioned his jump shot was a topic of discussion amongst fans last season on many occasions. I thought I’d take a look into his jumper to see what were his best shots, what were his worst shots, and what he could do to get better going into next season. Here’s what I found. Instead of looking at all 3-point shots together let’s break them down into the different types of attempts. Let’s first look at catch and shoot jumpers, because I think you’re about to be floored. While Nembhard was great shooting the ball when his feet were set he was nowhere near as good shooting off the bounce. He was 20% on threes off the dribble which brought his overall 3-point percentage down to earth and he also forced up a lot of dribble jumpers which weren’t very high value shots. On midrange jumpers off the dribble he shot 26.8%, and far too many of them came in the middle of the shot clock when the Gators could have hopefully worked for a better shot. 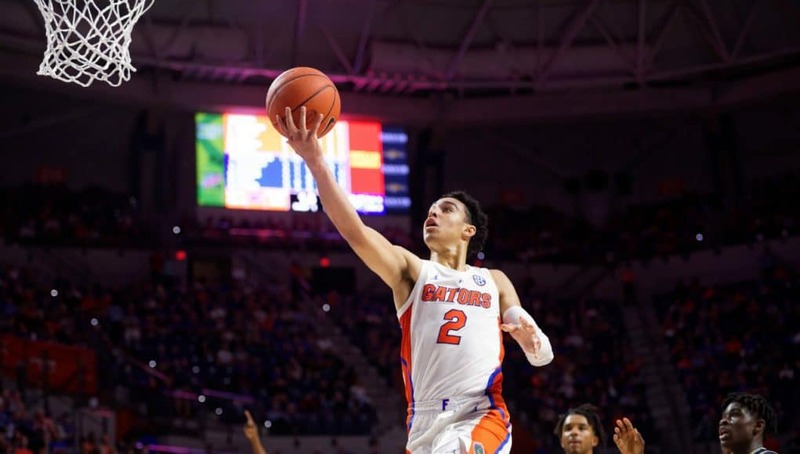 I wrote about expected shot value for Florida’s game against Michigan, something that I’d love for you to check out if you haven’t yet because it frames the expected shot value system out nicely, and with an expected shot value of 0.536 Nembhard’s midrange jumper is not a great look. It should also be noted the spot that he took the most midrange jumpers from (straight on, between the free throw line and the 3-point line) was also one of his worst percentage spots on the floor at 14.3%. Some of his dribble jumpers were the result of late clock situations where he had to force something up, an unfortunate product of being the primary ball handler on a team that struggled to score, but as I mentioned earlier a lot of these shots came between 11-20 seconds into the shot clock which would have still given the Gators a chance to work for a better attempt. As a ball handler in modern basketball shooting off the dribble is a valuable skill and it’s not an attempt you can take out entirely but I think while also improving his ability to shoot off the bounce Nembhard needs to take out some of the tougher contested twos earlier in the clock. When looking at Nembhard’s overall shot chart something sticks out immediately and it’s the fact he is much better at shooting from the right side of the court than the left side. For example, from the right 45 3-point line he’s shooting 41.7% and from the left 45 he’s shooting 30.8%. When it comes to midrange jump shots from the right wing he’s shooting 60% and from the left wing he’s shooting 33.3%. When it comes to straight on threes he’s shooting 32.4%, though it should be noted he’s shooting a blistering 54.5% on catch and shoot threes while only shooting 21.7% from that spot on dribble threes. Is the fact he’s better from the right side than the left side or the fact he can catch and shoot straight on but struggles to pull up off the dribble coincidence? I don’t think so. And here’s why. Let’s take a look at Nembhard’s jump shot and I think we’ve all noticed it. He has a low release with the ball on the right side of his face. Is that a problem? I think it could be. Here’s my running theory, and while it’s just a theory you can let me know what you think. I think Nembhard is left eye dominant and his low release on the right side of his face makes it much more difficult for him to shoot from some areas of the floor than others. Everyone has one dominant eye, and two-thirds of people are right eye dominant (from the US National Library Of Medicine, shout-out to Google), and I think Nembhard is in the minority. Look at his release once again and see how his right eye is mostly shaded by the ball. If he’s a left eye dominant person, the covering of his right eye to allow his left eye to focus on the rim could be something he’s done for years subconsciously as you see with a lot of young basketball players. As I noted before, look at the fact he’s so much better shooting from the right side of the floor than the left. When he’s on the right wing when he raises the ball up to shoot his left eye, the one I think is his dominant, is still going to be in line with the hoop and he’ll be able to focus on it. Seriously, pretend you’re shooting a basketball like Nembhard and imagine you’re shooting from the right 45, you’ll still see the hoop with your left eye. But when he shoots from the left 45, his left eye is not going to be aligned with the hoop, it will be aligned with the left side of the backboard (once again, try pretending to shoot with Nembhard’s release and imagine you’re on the left 45, it would be a major challenge to see the hoop). Even if he’s not left eye dominant like my theory would hold, the alignment of his left eye that is the one uncovered by his release seems to really affect how he’s able to shoot, especially off the dribble where he needs to pull up with the basketball, find the rim with his eyes, and deliver a shot in quick order. The fact he’s able to catch and shoot affectively from almost everywhere around the arc could largely be do to the fact he can lock his eyes on the rim before receiving the ball and entering his shot, allowing his eyes to capture where the rim is before he enters his shot routine. The fact one of his eyes is covered during his shot definitely does not seem to help when it comes to quickly finding the rim in a catch and shoot scenario. 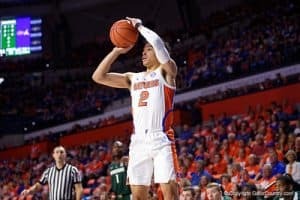 Florida Gators guard Andrew Nembhard (2) shooting during the first half as the Gators fall to the #10 ranked Michigan State Spartans 63-59 in Exactech Arena at the Stephen C. O’Connell Center in Gainesville, Florida. December 8th, 2018. 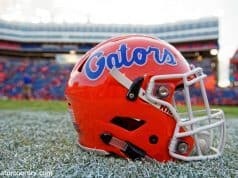 Gator Country photo by David Bowie. Another problem with his shot release is that the low position of the ball means he has to have his guide hand so high on the ball to get out of the way of his left eye. Look at the picture of his jump shot again. Ideally, a shooter’s left hand would be on the left side of the ball. With Nembhard’s low release, if he had his left hand on the left side of the ball it would be directly in front of his left eye and he’d have no eyes left to find the hoop. For the last time I say, try it out. 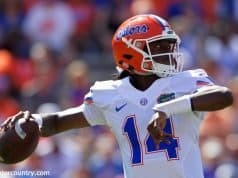 Pretend you’re releasing the ball where Nembhard does but put your left hand on the left side of the ball, it’s now directly in front of your left eye while your right eye is blocked by the ball. Since he can’t do that, he really raises his left hand and gets it almost on top of the ball which isn’t ideal. I looked at every missed jump shot Nembhard had this year and tracked if he missed it short, long, to the left, or to the right, and this is what I found. As you can see, he missed to the left more times than he missed to the right by a noticeable margin. When I watched the film and saw him miss left, it appears that he seems to yank the ball just a bit to the let when taking his left hand off of the ball before the release. That isn’t the only issue with his guide hand. Someone who shoots more prototypically with their left hand on the left side of the ball can keep two hands on the ball right up until the moment of release, but since Nembhard’s hand is on the top of the ball he has to take it off much earlier in the process, relinquishing some control of the ball and sacrificing some accuracy. 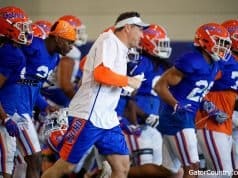 You can see that here with a shot he took against Florida State. 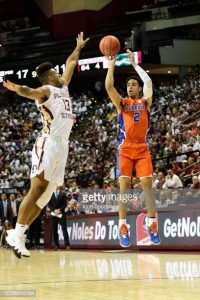 This summer I think Nembhard needs to work on raising the release point of his jumper to allow his eyes to get fixed on the rim, as well as allowing his left hand to get to the left side of the ball instead of the top which will add a lot more accuracy. And once again, even though there are mechanical problems he actually shot the ball pretty well this season. His somewhat clunky form made people question his jumper a lot more than they should because the numbers show he actually wasn’t bad and when he was just able to catch and shoot he was actually elite. While I see a lot of the dribble jumpers he took this season as bad looks I’m sympathetic to the fact that he was shouldering a lot of the offensive load and he needed to try and create shots out of not a lot at times and next season should see more open catch and shoot jumpers for him which could result in a whole lot of splashed threes. Considering how good his freshman campaign was if he turns into a great jump shooter, watch out.